Doing things backassward but older not always wiser. So now I am asking what kind of tarps other people use, what size, shape etc? Check out some of the threads in the Similar Thread pane at the bottom of the screen. I had a Kelty 12’ tarp set up at the Billings BMWMOA Rally. A wind gust bent one of the poles. Fortunately REI replaced the pole. While I enjoyed the shade, I ended up switching to a Redverz tent. I have looked at the stuff on amazon and eBay that cost 1/2 as much, I have also looked at motorcycle tires on same two sites that cost way less than the known good brands but just can’t bring myself to try them. My "camping tarp" is a large, Big Anges 4 person tent ground cloth I found in an outdoor store clearance box. It's waterproof, has several loops for hanging and packs up really small. Works great without the bulk and weight of an actual tarp and it will easily cover a picnic table with everyone sitting at it. I think I paid $19 for it. I too have the Noah 12, but will be in the market for a 9 instead. I use 2 Kelty's staff poles and 2 REI adjustable poles. I've added adjustable, reflective guylines to all of the optional tie-outs, and it's survived some good storms. Having a big tarp will attract current and future friends in a hurry. I use a collapsible trekking pole, not the bike. In bad weather you can use the bike to guard the entrance, otherwise I like having a view. My sleeping bag goes in a waterproof bivy. I use a Moss Parawing, which is no longer made but probably the best at shedding wind and rain. You really do want something that stands up in windy conditions. I have camped with a lightweight sleeping bag and a small tarp. One evening I was with a friend and he was equally equipped. As the sun went down the mosquitoes came out in force. We both had our tarps hanging between the bikes and tree and ended up pulling down the tarps and covering ourselves completely. Damn near cooked under that tarp as it was a warm night, but survived the 'skeeters. After that I use a light weight tent if I camp. You made me laugh reminding me of one of those nights with just my nose sticking out of my sleeping bag and having a multi bite nose at dawn.I was in a sauna. Yeah, kinda like being able to control the enemy in some locales and close most of them out. FWIW...I have as a permanent part of my camping kit one of the head nets. Works awesome, packs small, you can still see through it and it allows you to sit outside at camp regardless of the skeeter situation. Highly recommend. 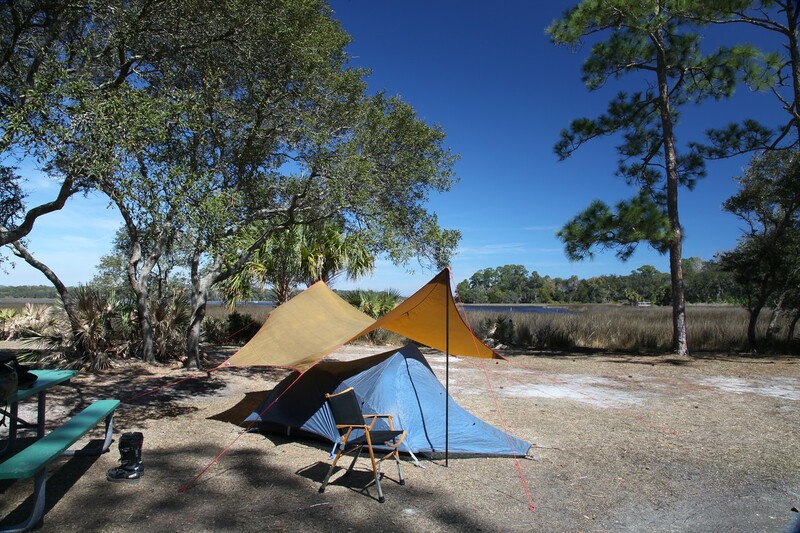 If you camp, do you use a tarp/awning? camping: is camping at the national full?